Only small fraction of floppy drives works well with Atari ST machines media (disk) change detection system. Reason is that Atari used non-standard solution, to spare some lines. Here I will describe concept, and will give concrete solution for floppy drive Chinon FG-357. What we need for media change detection? - pin WP (#28) on floppy connector must be active (low) when no floppy in drive. This is all, but most of drives works not so, and this line is active only when write-protected floppy is in drive. With simple logic, it can be achieved on all floppy drives. Unfortunatelly, no general 'pin' solution, because user must find one specific point on drive - where floppy presence is detected. Combining it with WP line will give desired result. For logic we will use Quad open-collector NAND circuit 74LS03. On picture above is floppy drive Chinon FG-357, modded for Atari ST. There is line and logic for HD/DD switching too (long black wire out). For media change detection we use 2 NAND gates: Black wire connected to one pin near to right bottom is on Low when floppy is in, and on High when no floppy in drive. It goes to pin 9 of IC, and there is one resistor of 4K7 to GND. On other input of gate (pin 10) goes inverted signal from drive A select line (pin 10 of floppy connector) . There is of course pull-up resistor ( 4K7 ) for open-collector. Output of gate (pin 10) goes simple to WP line ( pin 28 of floppy connector ). Because it is low active, it will go to low always when drive is selected and no floppy in it. Only lower 2 gates on schematic are required for media change detection circuit. Third gate is for HD/DD switch control. 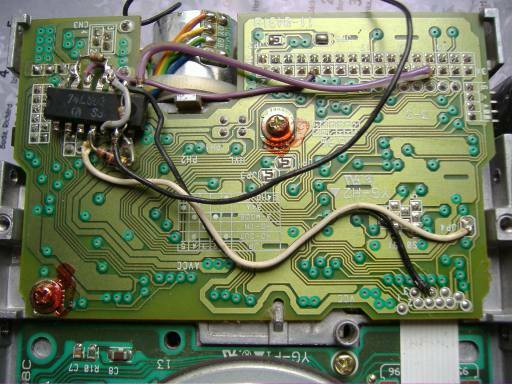 On photo, white line connected to JP4 is for HD/DD switching - it goes on pin 4 of IC (there is 10K to GND too), and AND-ed with inverted drive A signal goes to Atari (black wire out)- there is no line for it in standard Atari floppy cable, so you need to lead it somehow to Atari and drive 8/16 MHz clock switch with it. By different drive you need to find point on circuit where floppy presence is detected. If it works inverted than above (so Low when disk is out), then you need to invert it first - there is free gate for it on IC.